"We've also improved the launch process. "It used to take 14 people an hour or two to launch a balloon, now with an automated crane we can launch a balloon every 15 minutes with two or three people." 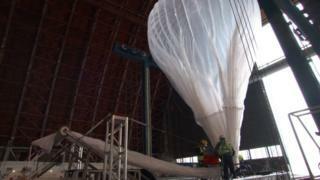 "[We need] about 300 balloons or so to make a continuous string around the world," he explained. "As one moves along with the wind out of range, another one comes to take its place. Because each balloon only provides connectivity to a ground area 80km (50 miles) in diameter below it, the initial ring will be take place south of the equator where the circumference of the earth is about half that of the equator. "[We recognise] Project Loon as one of the latest technological innovations, which would be very advantageous in expanding internet coverage in areas that are difficult to reach and also have a low population density," said Telkomsel's president Ririek Adriansyah. "It can thoroughly complement our network."